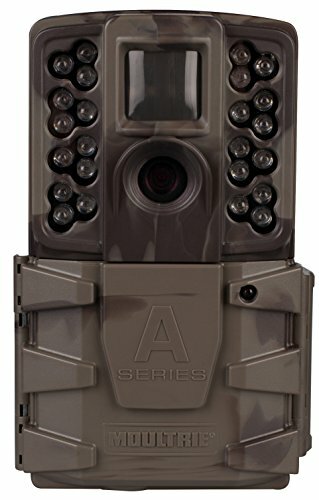 The Moultrie A-40 Pro game camera offers impressive capabilities at a surprising price. With 14-megapixel resolution and a.7 second trigger time, you’ll capture images other lower-priced cameras might miss. Each one a vivid record so detailed, you’ll easily be able to distinguish one trophy buck from another. And when the sun goes down, the A-40 Pro really shines thanks to an Illume-Night Sensor that provides the brightest, clearest nighttime images possible. The Long-Range Infrared Flash reaches out to 70 feet and is paired with a detection range that’s also 70 feet, the result is better quality images even at longer distances. Powered by eight AA batteries, you can expect to get up to 17,000 images before changing batteries. The A-40 Pro is also Moultrie Mobile compatible. An easy-to-use interface with backlit buttons make setup in low-light simple. And, of course, it comes with the known dependability that keeps bringing hunters back to Moultrie. But we still back it with our two-year warranty. The A-40 Pro uses Moultrie Smokescreen camo.